Vancouver's natural assets and temperate climate make it one of the best cities in the world in which to live, a new survey says. The annual quality of life survey released by Mercer Human Resource Consulting placed Vancouver third out of 215 cities, the same as last year. Vancouver's climate helped it rise in the rankings, according to Mercer spokeswoman Danielle Bushen. The only two places that beat the West Coast city were Zurich and Geneva in Switzerland. 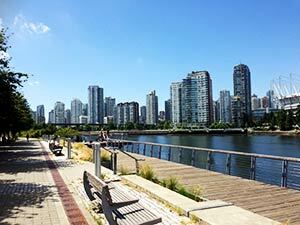 As the largest city in Western Canada, Vancouver, BC, is the ideal place to visit. There are very few places in the world that offer the same kind of grown-up playground as Vancouver, BC. For one, where else can you sunbathe on an ocean beach in the morning, go skiing in the afternoon and play a round of golf after a 5-star dinner at one of the many exquisite restaurants, and then catch an NHL game, go see a Broadway-quality show and stop by one of the city's excellent live venues to catch some music and dance, all in one day? In Vancouver, BC, all this is possible and more. 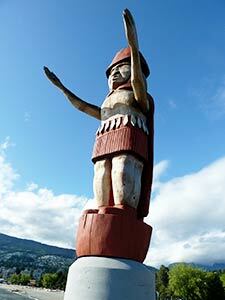 Vast archaeological finds show that coastal Indians were active in the Vancouver area by 500 B.C. but most likely the area was home to some of the earliest human settlements, thousands of years ago as nomatic tribes crossed the land bridge from Russia and made their way down the coast to South America. 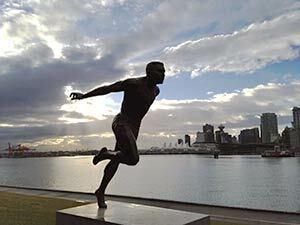 The British first arrived in this area with the help of their naval captain, George Vancouver, in 1792. What is now known as the City of Vancouver was first founded as a sawmill settlement called Granville in the 1870's. The city became incorporated in 1886 and was officially named after the English Captain who "found" her - Captain Vancouver. During these times the city was fast becoming known as a good place to do business with the discovery of coal, which attracted many of the white settlers to the area. Soon Vancouver was a veritable thriving metropolis thanks to the Canadian Pacific Railway which allowed for safe passage across the Rocky Mountains and permitted settlers from the east to travel here to colonize the area. Today's Vancouver is a playground for children and adults alike. Indulge in the award-winning restaurants and eateries. Stroll down the streets of one of the many trendy fashionable clothing areas of the city. Visit some of the best antique stores, museums, art galleries and theatres in the world. Some of Vancouver's most popular destinations are its public parks, such as, the world famous Stanley Park, such as, sandy beaches like Kitsalano beach, and natural splendour, such as, the grouse mountain or Capilano Suspension Bridge, which are all easily accessible from Vancouver. Stanley Park, surrounded by ocean and sandy beaches and spanning 1,000 acres, is one of North America's largest urban parks. Preserved from the turn of the century, the park contains many spectacular old-growth trees and sprawling gardens. Surrounding the park is the Stanley Park Seawall, where joggers, walkers, cyclists and people on roller-blades can travel to and from downtown without having to travel in car traffic. When you are in the park you can take a stroll down a lush wooded trail, admire the vast gardens or enjoy a picnic in one of the park's many open areas. While you are enjoying the park, you can also visit the Vancouver Aquarium, which features an amazing array of ocean creatures, including but not limited to whales, sharks, sea otters and dolphins. When passing through Stanley Park and over one of Vancouver's world-famous bridges - the Lion's Gate bridge - look to the Fraser River inlet to see windsurfers, kayakers, boaters and fishermen playing and working in and around the waters of English Bay, with luxurious sailboats and massive cruise ships creating the perfect backdrop. As Vancouver is also known as LA of the North, it is not just because of the thriving film industry which boasts Vancouver as the third largest film-production center in the world, but also because of the amazing selection of shopping. There is a shopping district in Vancouver to suit every style taste and desire. To name a few, Granville Island and its toy stores and art galleries, Robson Street and its cafes and Haute Couture boutiques, Kitsilano with the most trendy fashions, Chinatown where you can find anything Asian, Gastown's cobblestone streets and bric a brac shops, Metrotown mall shopping at it's best and many many more. If arts, music, and entertainment are what you seek, spend an evening listening to the Vancouver Symphony Orchestra, as musical director Bramwell Tovey brings greats like Pinchas Zukerman, Holly Cole and locals, such as, John Pizzarelli to the stage. Plan your visit around the Vancouver Folk Festival or the Vancouver International Jazz Festival, where you can enjoy literally hundreds of live shows. many of them free. Or come at any time of the year to experience live venues of every kind from top quality Jazz and Blues to more modern styles of music to an excellent club scene: Vancouver lives at night. For an indoor cultural experience, check out some of Vancouver's many museums. This fabulous Museum of Anthropology houses the best collection of Northwest Coast First Peoples artifacts in the world. The Vancouver Museum, Canada's largest civic museum, is full of unique events, programs and exhibits. The Vancouver Maritime Museum features Pirates Cove, a self-guided tour of the RCMP schooner St. Roch and many rotating exhibits. The M.Y Williams Geological Museum is the only museum of its kind in BC, with exhibits that include an 80-million-year-old Lambeosaurus found in Alberta in 1913, spectacular rocks, minerals and fossils. The Granville Island Museum is actually three remarkable museums in one building. You'll find model ships, information about the Canadian National and Canadian Pacific Railways, including memorabilia, model trains, and fishing equipment, with hundreds of reels, creels, tackle cases, bait boxes, flies, lures, fly-tying equipment and bobbers. And last but not least the Vancouver Art Gallery. Housed in the old court house on the corner of West Georgia and Hornby, the Vancouver Art Gallery is not a gallery at all but the city's art museum. With myriad things to do, places to go and items to see in Vancouver, people are not only coming here for a vacation, and for an experience of a lifetime, but are also moving here in greater and greater numbers because it truly is an incredible place to visit, live and play.